It takes just one caring person to make a difference in a child’s life. It takes someone like you. 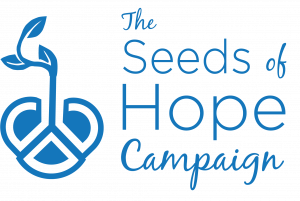 Plant your Seed of HOPE for a Child’s Future! Our mission is to provide hope, healing, and a voice for justice for abused and neglected children in our community. Every year, many children in our community are victims of child abuse. In 2016, the Children’s Advocacy Alliance served 473 children. It is up to us, as a community, to “plant a seed” for that child’s future so they can have the opportunity to have a new emergent life. Our agency oversees two programs that serves and protects these children. CASA of the 20th Judicial District provides trained advocates that are fully committed in being a voice for abused and neglected children. The CAC provides a safe and neutral environment for children to undergo forensic interviews, therapy sessions, medical exams, and advocacy services. All services that we provide to these children are at NO cost to the child and family. Together, our goal is to serve 100% of abused and neglected children in our community. As of right now we are only able to serve 60%. Your monthly contribution can make a significant difference in a child’s life. Children are our future. Join us in helping us serve as a beacon of HOPE for victims of child abuse. Click here to download the mail in form to donate to the CAA. It takes just one caring person to plant the Seeds of Hope and make a difference in a child’s life. It takes someone like you. This annual giving initiative raises funds to support the Children’s Advocacy Alliance’s mission of promoting excellence in child abuse response and prevention through service, education, and leadership. Every Hope Planter will receive a monthly e-newsletter and a listing in the annual report as a small token of our gratitude. Thank you for the difference you are making in the lives of these children. 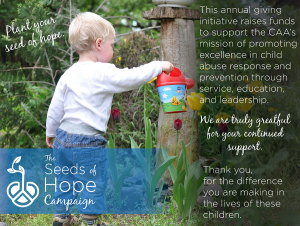 Thank you for being a part of our Hope Garden. Your donation is 100% tax deductible.